After the cutoff date of August 16, 2019, please call hotels directoy to make reservations. Hotels will continue to make discounted reservations for attendees on a space-available basis. Parking: $19 max per day for self-parking, $47 max per day for valet parking. Hotel Description: This convenient hotel near the Port of Miami is the ideal destination for business and leisure travelers. The hotel offers a variety of thoughtful amenities that will make your stay enjoyable and productive, like a heated outdoor swimming pool, fully equipped StayFit gym, and restaurants onsite. * Government Rates: The current government rate in Miami $119 per night (subject to change). Government rates are only for U.S. government personnel paying for a room with a U.S. government issued credit card. Failure to pay with a U.S. government credit card will result in your reservation being honored at the group rate. Government contractors not traveling with government travel orders are not eligible for this rate; All Federally Funded Research and Development Centers qualify for government rates. Parking: $35 for Self Parking, $40 for valet parking. Hotel Description: Courtyard Miami Downtown/Brickell Area puts guests in a prime location near both the financial district of Brickell and the entertainment center of Downtown Miami. Just a short walk from our hotel is the Bayside Marketplace, great for shopaholics, and American Airlines Arena, perfect for sports fans. 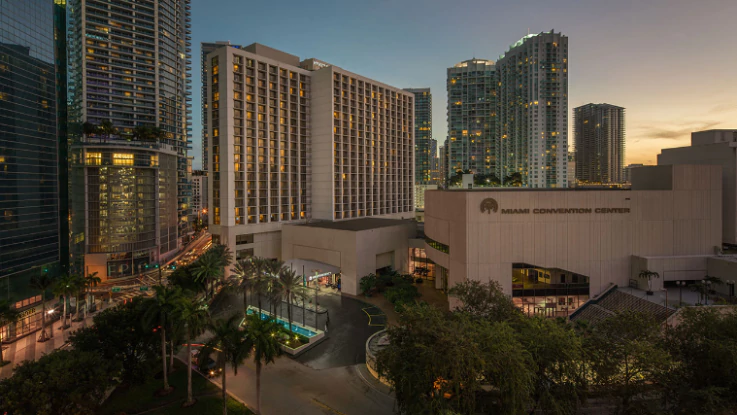 Get a restful night's sleep in large guest rooms and suites featuring plush bedding and free Wi-Fi, and wake up to floor-to-ceiling windows offering incredible views of the Downtown Miami skyline. In-room feature living/sitting areas perfect for entertaining guests. The hotel offers convenient amenities including an on-site bistro offering fresh meals, coffee and cocktails, as well as a state-of-the-art fitness center. Save $200 on your registration by staying in an official conference hotel. Save $200 on your conference registration fee by staying in one of the official ION GNSS+ hotels listed above. To qualify for the discount, make your hotel reservation before you register for the conference. Then, enter your hotel confirmation number on the registration form to receive the discount. Why we do this. Please note, the hotel discount cannot be applied retroactively be sure to make your hotel reservation before registering for the meeting.